Our August Alum of the Month is Ervin Mitchell III (EJ) (Beijing, Spring 2011), an alum of Amherst College. After his semester in Beijing, EJ served as a Resident Assistant for the program. He then became involved with Project Pengyou, an alumni network for President Obama’s 100,000 Strong Initiative, which works to increase the number and diversity of Americans studying abroad in China. The word pengyou means “friend” in Mandarin. EJ’s advice to other students? “Empty your cup.” Continue reading to find out what he means! IES Abroad: Why did you choose to study in Beijing? EJ Mitchell: I've had a strong interest in East Asian culture that started from a friendship with a childhood friend who was half-Japanese. It had been a lifelong goal of mine to go to Asia. Having grown up fascinated by Japan, I decided on a whim after high school to switch my focus and study Mandarin during my freshman year at Amherst. I had a wonderful professor who was from Beijing, and I realized that in order to truly understand and fulfill my desire to know more about Chinese history and culture and to strengthen my language skills, I needed to study abroad in Beijing. IES Abroad: What was the most memorable aspect of your time studying with IES Abroad? EJM: I am very fortunate to have had the opportunity to live with a Chinese family. Not only did [it] help to improve my Mandarin tremendously, but it provided insight into daily life in China that my classmates who lived in the dorms did not have. I had a fantastic relationship with my homestay family, especially with my little brother. Extremely candid, never lacking energy, and only five years old at the time, he was my guide to understanding the Chinese family unit in a way that invaluably enriched my study abroad experience. I can't imagine my China experience without him. IES Abroad: What are the three biggest cultural differences between China and the United States? 1. The concept of 抢 (qiang) which translates as to scramble or vie for something. At first glance, people in China seem extremely impatient and anxious. However, this cultural mindset has deep-seated historical precedents, and it affects the way people drive and pack on to buses and the subway, produces a seeming lack of etiquette when it comes to waiting in line for your turn at something, and results in a cut-throat culture in the academic and professional worlds. It feels very much like a case of early bird gets the worm on steroids, and even after more stays in Beijing is something I'm still not fully accustomed to. 2. The emphasis on regional differences and loyalties. The degree to which Chinese take pride in celebrating the culture of their hometown (lao jia), embracing lao xiangs (people from the same town), and paying reverence to ancestral origins is something that is rarely found in the U.S.
3. As someone who is fascinated by linguistic traditions, I find the diversity of spoken dialects and languages in Mainland China alone absolutely incredible. IES Abroad: How did you become a Resident Assistant for IES Abroad Beijing? EJM: During the end of my semester abroad, the Beijing Center held a "Going Home" talk that focused on re-entering life back in the States and the risk of reverse culture shock. There was also mention of ways to ease that transition by staying connected with your China experience through various channels. I knew that I wanted to return to Beijing as soon as possible and thought that returning as an RA would be a great way to continuing studying Chinese, reconnect with my friends and homestay family, as well as begin a new chapter in life as a college graduate. Definitely one of the best decisions I've made thus far. IES Abroad: What have you been doing since? EJM: After completing my year as an RA for IES Abroad Beijing, I returned home to teach at my alma mater Cincinnati Country Day School. In addition to teaching an info tech elective in the middle school, I co-taught a senior history elective on Modern China and worked with the Director of Admissions to find ways to better support Chinese students in our community. In March of this year, I visited Harvard University as a member of the inaugural Project Pengyou Leadership Fellows program. IES Abroad: Tell us about Project Pengyou. What does it mean to you, and what should people know about it? EJM: Project Pengyou is an initiative launched by Holly Chang and the Golden Bridges Foundation that seeks to build a network of American China alumni (study abroad, personal, and professional) that seek to empower others to engage in purposeful discussions about U.S.-China relations. 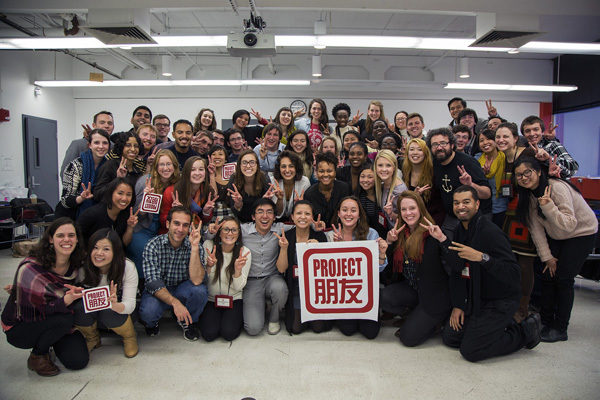 As a leadership fellow, my role is to work at the grassroots level to organize a chapter of Project Pengyou that seek to help create a critical mass of U.S.-China bridge builders and offer access to educational, social, and professional resources to establish and maintain sustainable change within my communities. It's an incredible opportunity for Americans at any and all levels of interest to directly engage with a global network. Currently, I work as an educational counselor in Beijing. IES Abroad: What are your goals for the future? Do you plan to stay in Beijing? EJM: My current goals for my future culminate in a desire to continue to work in the fields of international education and cross-cultural management. I would like to be in a position that empowers youth to take advantage of cultural exchange and study abroad opportunities, as well as one that engages members of a community in creating strong networks of support for individuals and groups from bilingual and bicultural backgrounds adapting to a new environment through academic, social, and professional mentorship. I very much enjoy the life that I have here in Beijing and plan to ride it out for as long as possible. I'm also planning to do more traveling. IES Abroad: What advice would you give other students thinking of studying abroad? EJM: I would say definitely go! And when you do, to borrow a phrase, "empty your cup". Leave what you think you know at home and let your study abroad experience help you redefine your view of the world. Don't worry about the "FOMO" (fear of missing out) – you'll see your friends and family again! You have so much to gain from taking the plunge into another country's culture and you'll thank yourself over and over again over the years.